Beall’s list can still be found on archives up to the end of December 2016. There is no certainty as to why it closed but it seems he may have been threatened with litigation from one on the publishers he had on his list. Unfortunately there is no credible follow-up at this stage. There are also journal plublishers that are listed on Beall’s lists but some of their titles are on IBSS for instance. One publisher KRE which was listed as predatory is now co-publishing with Taylor and Francis who respond to my query on this by saying they did research and found KRE to be a good publisher to co-partner with and that they would certainly not publish with a publisher that is predatory. This begs the question – were all Beall’s listed publishers really predatory or not? Remember he was very anti-OA and especially against any non-American publishers. I notice that a website at https://predatoryjournals.com is trying to continue Beall’s list by asking for contributions, but there is no information as to who the compiler or owner of the web is, nor the criteria, or standards in place to stop anyone from putting any title or publisher on the list. Once on the list, it is difficult to get off. 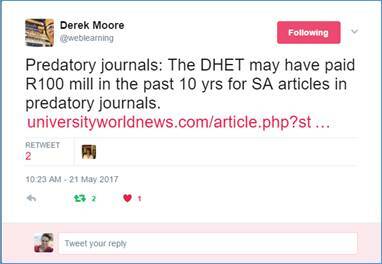 It would be great to have a comprehensive White List of publications but this is partially possible through the accredited DHET journal lists and the DOAJ, but there are many OA and other journals that are good but not on those lists and that is where the problem comes in. Serious research is necessary when using a publisher or journal that is not on the accredited lists. I am doing some research on the topic of predatory publishers but will not venture into compiling a list as this is likely to be biased, flawed or not comprehensive and its value or non-value will be determined by who uses it and for what purpose.